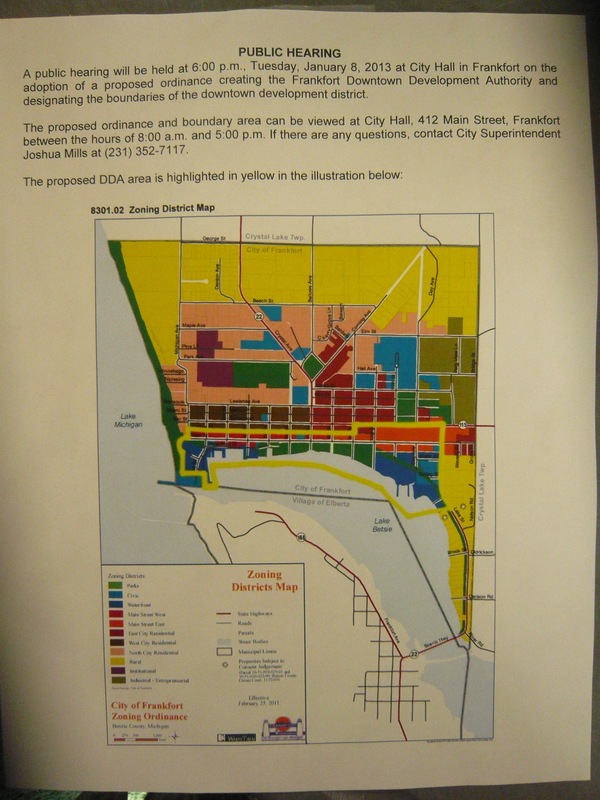 FRANKFORT CITY HALL—Frankfort City Council held a public hearing this evening on its proposed Downtown Development Authority and Downtown Development District (seen below outlined in yellow). City Superintendent Josh Mills made a presentation on the proposal, along with city attorney Peter Dorn. Business owners Dale Evans, Bob Korten, and Steve Christian had prepared a handout (see below) with questions and some answers provided them before the meeting by Josh Mills. The Downtown Development Authority would be established by an ordinance adopted by the City Council. Its board would be at least 51% constituted of property owners within the Development District. “Property” is understood to mean personal property as well as real property, and therefore owners of franchises or others who run businesses in the district but do not own their lots/buildings would count as “property owners” for board membership purposes. Board members would be appointed by the City Council. Development Districts/Authorities are provided for under the State of Michigan’s Public Act 197 of 1975. A Tax Income and Financing (TIF) Plan is required to spell out what the tax monies will be used for and how long the Development Authority/District will be in place. Once established, the DDA may use increases in tax revenue within the District (over and above taxable value before the establishment of the District) to fund improvements within the District. The idea is that new business may be enticed to say, the east end of Frankfort, with the promise that the city will make improvements to certain public facilities, such as parking, restrooms, park areas, lighting, water/sewer, etc., using new tax revenue from the district. The DDA would have the authority to take all this new tax revenue, meaning it would not go as it normally might to other millaged services, such as the Benzie Bus, the Maples, or the county Recycling program. Schools, however, would still see increased revenue from the increased development.